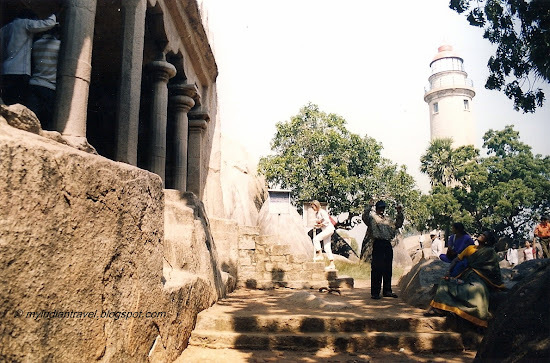 Mahabalipuram is famous for finely carved rock cut shrines. Adjacent to the hill on which there is a lighthouse, there is a superb rock-cut shrine of Mahishasuramardini Mandapa. This is a 7th century cave temple where front part adorned with four columns. There are two impressive friezes one at each end of the long veranda. On the panel in the right, Goddess Durga seated astride on her lion wielding an assortment of weapons. She is slaying a buffalo-headed demon, Mahisha, who disturbs the delicate balance of life. Goddess is accompanied by eight ganas, where as Mahisa with his army of seven demons is retreating. Hence, the name Mahish-asura-mardini meaning ‘destroyer of demon’. 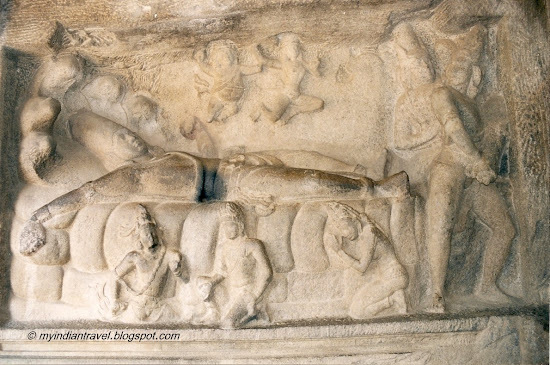 At the opposite end of the veranda, Lord Vishnu is lying under the protective hood of the seven-headed serpent Adishesha in the sea of eternity. Below Vishnu there is Bhu-devi, Mother Earth. Above and below the God are shown four flying ayudh-purushas - divine weapons of Lord. Nice and interesting carvings . Life is beautiful. This truth is as old as time itself. Your images assure me of that. Loved those carvings in the last two pics ... Beautiful! Always fascinating, Rajesh, a glimpse into your world. very interesting frescoes. they certainly tell stories. Interesting place......and very close to where I stay presently. Wonderful capture! I quite forget how this place looked then. Thanks for the post rajesh. Wonderful and interesting post as always, Rajesh, as well as superb captures! Always delightful to visit your world each week! Enjoy! I'm very impressed with the friezes, for sure! They are still in such great shape after all these centuries! I am always amazed by the artistry of the temples you show us. I never tire of the incredible carving!! Boom & Gary of the Vermilon River, Canada. Amazing carvings, Rajesh! India must have the most beautiful temples and shrines. Thanks for shring your world. A most impressive cave temple. The first frieze is very well preserved and also very beautiful. Awesome carvings and excellent photos of them. It's hard to imagine how long they've been there! This temple is truly magnificent, thank you for sharing it with us. Great captures Rajesh, love this revisit. I never tire of seeing these beautiful carvings. Lord Vishnu looks to be very well protected under that serpent! the carvings are exquisite. thanks for sharing. To be able to visit something so well preserved from the 7th century is AMAZING to me downunder in OZ ... You're very lucky!! That looks a marvellous place. Amazing how the sculptures vary from place to place and in different eras too!! love the effect the friezes create. What a lot of Ms you found! It's interesting learning about your part of the world, thank you. Lots of the letter M, Rajesh, but impossible for a mere Canadian to pronounce! always marvel the work of the artisans. I think Hinduism is full of legends and symbolism. There are so many gods and goddesses. Your temples are very beautiful! Thanks for showing. I haven't been to a cave temple in a while. They're good when you are boiling alive outside in the sun. Love the sculptures here. So complex and exotic. Beautiful art. Wow, impressive! Thank you for sharing. Thank you for sharing this fascinating temple with us. The rock carvings are indeed intricate and detailed. I am in awe of the beauty. And of the words '7th century'. Incredible. I can never get over the impressive man-made structures from so long ago. I really want to know India. Indian culture is fascinating. Thank you all. I am glad you all likee this carvings. Fantastic shots of moon. Very cool. 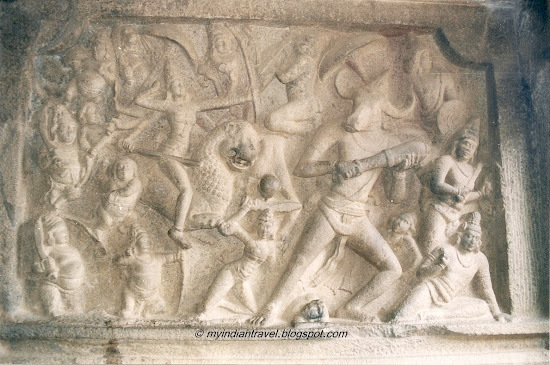 Mahishasuramardini of Mahabalipuram is truly magnificent.Yours is a nice photography. I never tire of watching the beauties from Mamallapuram....beautifully picturised and described!! Beautiful pictures.. abs love them. I have a very very ver faint memories of visiting here as a kid. Glad I found you at Indiblogger. Your newest follower and a regular reader now. Beautiful carvings... mahishasuramardhini one is lovely. Lovely! Thanks for the virtual tour - I've always wanted to see Mahabalipuram. Thank you all. I am glad you all liked these carvings.